Printed Queen-Sized Duvet Cover Set Just $18.99! Down From $40! You are here: Home / Great Deals / Amazon Deals / Printed Queen-Sized Duvet Cover Set Just $18.99! Down From $40! I know relatives and friends are coming over this holiday season so you better be well-prepared! At Amazon, this Printed Queen-Sized Duvet Cover Set is now on sale for just $18.99 down from $39.99 PLUS FREE shipping with Amazon Prime or for orders over $25! Dress your bed lavishly with this printed microfiber duvet set. 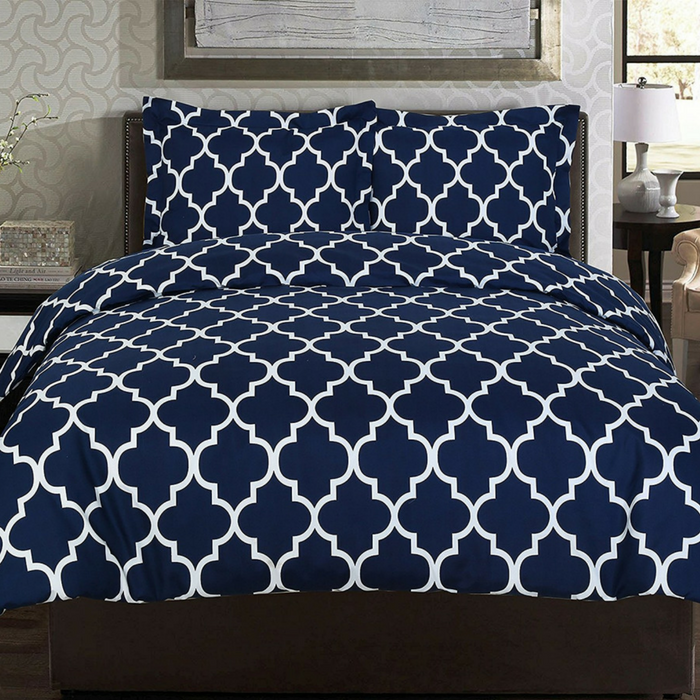 Featuring a white fretwork pattern on grey or navy base, this printed duvet set coordinate easily with your existing bedding set. Each set contains a duvet cover measuring with hidden button closure and two pillow cases. Now you can conveniently buy basic bedding in a single package rather than purchasing each item separately. It is often less costly to buy a duvet set than to buy everything separately.